To View V8 Registry Newsletters - CLICK HERE must be a V8 Registry member to access this information. Want to find contact information for a specific V8 Registry Member - ﻿CLICK HERE﻿ to access the "V8 Registry Membership Roster" page. You must be a V8 Registry member to access this information. Want to communicate with leadership of the V8 Registry - ﻿CLICK HERE to go to the CONTACT US form. Want to upload photos for use on your personal web page on this site - CLICK HERE to go to upload the photos. ​ Please note that you must be a V8 Registry member to have a personal web page. When on the "Members Vehicles" or "V8 Registry Membership Roster" pages, if you click on a photo you will be re-directed to to that member's personal web page. Click on a photo on a member's page and it will be "spotlighted" to a larger size. Have something you want to buy or sell that is pertinent to Corvair conversions - ﻿CLICK HERE﻿ to enter the V8 Registry Forum and post it. Looking for technical advice regarding V8 Corvair conversions - ﻿﻿﻿CLICK HERE﻿﻿﻿ to access the V8 Registry Forum. Want to post photos relevant to V8 Corvair conversions - CLICK HERE for directions on how to post photos on the V8 Registry Forum. 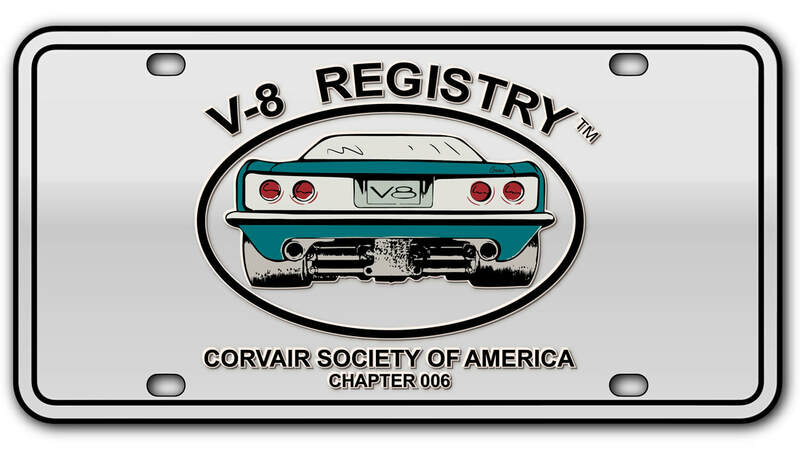 Want to join the V8 Registry - ﻿CLICK HERE﻿ to access our Membership Application. Want to renew your membership in the V8 Registry - ﻿CLICK HERE﻿ to access our Membership Renewal Application. ​Want to see the latest V8 Registry financial statement - CLICK HERE You must be a V8 Registry member to access this. Interested in more information concerning Corvairs - CLICK HERE to access the CORSA web site.